The Oyster Perpetual Yacht Master symbolizes the privileged ties between Rolex and the world of sailing that stretch back to 1950. Though this updated design was introduced at Baselworld 2012. The Yacht Master is revered for it casual yet purposeful allure. The large hour markers and broad hands are reserved for Professional models and remain extremely readable in all situations. The Yacht-Master is at home on deck on the open sea as well as on land in an elegant yacht club lounge. The Rolex 116621 is presented in a robust and masculine 40mm, 904L stainless steel/rose gold case. The Yacht Master 116621 features a bidirectional rotatable 60 minute graduate rose gold bezel. The polished numerals and graduations stand out clearly from the background. This particular bezel allows the user to calculate the time of sailing during a race, but most important is one of this model distinctive identity. 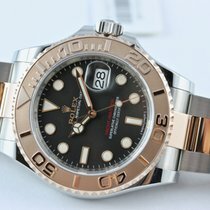 The 116221 black dial is characterized by Rolex 18ct gold hour markers. 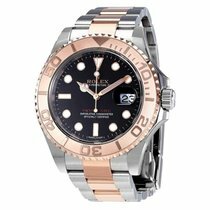 The Yacht-Master 116622 steel and rose gold oyster bracelet resembles the elegance delivered by Rolex tradition combining comfortability and robusticity. It has approximately 48 hours of power reserve, and is water resistant down to 100 meters. 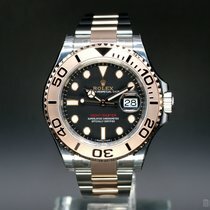 Rolex Yacht-Master 40mm Steel/Everosegold "Black Dial"